Wandering around the San Francisco Design District last week, I found this gorgeous HUGE furoshiki at Tansu Design. Unfortunately, I didn’t have my tape measure on me so I couldn’t tell you the exact measurements, but yes, that is a sofa it is draped across. I’d estimate the size to be roughly 4 feet in either direction. The furoshiki has beautifully executed sashiko in each corner, almost spreading out into the middle. Two opposing corners have a fan design with braided thread tassels and the other two corners have sayagata (key fret) and a variation of matsukawa bishi (pine bark) within a grid. I like how the borders of each section have a double row of stitches, and while the stitching is carefully and precisely executed, there is still a feeling of softness and delight in the overall piece. The cotton is soft, possibly handwoven and very likely hand dyed, and I would assume dates from the late 19th to early 20th century. It is four panels across, with the panels neatly stitched together with double rows of stitching in a dark-colored thread. Note the triangles along the borders, used to roll the hems down along two opposing sides, and simply to accent the selvedge along the other two. A tear in the middle of the furoshiki was carefully patched from the back using a separate piece of indigo cotton. The patch is stitched to the main fabric, and the tear has been tacked to the patch so that it would not tear or fray further. The last photo in the slideshow offers a comparison between the vintage indigo and a newer, modern piece designed as a table runner. The blues are very different, with the furoshiki a darker hue and the table runner a brighter one. It’s possible that the table runner was dyed with synthetic indigo, or simply that it wasn’t dyed using the same technique, and it certainly lacks the patina of old age. The sashiko on the table runner appears more contrived and less natural than the furoshiki, but both pieces have been exquisitely stitched. Several photos show the back of the furoshiki, as I am often asked about how the threads are knotted or stitches done. As furoshiki are single-layer textiles, loose or dangling threads would be not only unattractive, but also impractical. Matsukawa bishi is usually stitched as a continuous, interlocking design, but as done here in a grid, it requires far more knots. It would be interesting to do a large project such as a quilt with a basic grid to start, then fill in the squares with an assortment of traditional designs. 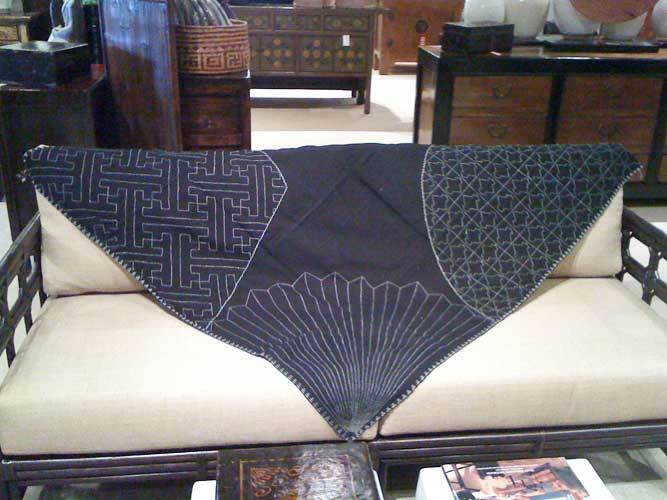 For more information, both sashiko textiles are available from Tansu Design in San Francisco, California.